Looking for office manager jobs? Your resume first must fully convey your business, technical and managerial skills. 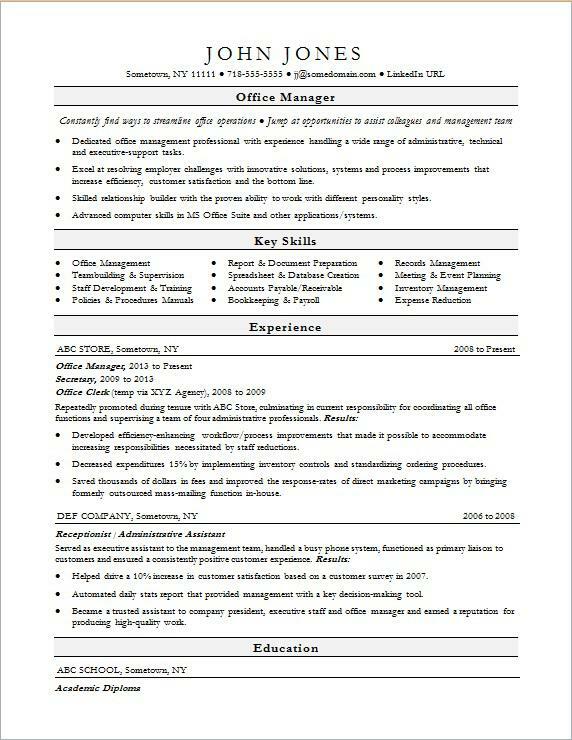 View the sample resume for an office manager below, and download the office manager resume template in Word. Jobs for office managers are projected to grow by 10% (or 28,500 jobs) from 2016 through 2026, which is faster than average, according to the Bureau of Labor Statistics (BLS). Among your many admin duties, you can also expect to be required to manage facilities and be prepared for emergency situations, so if you have prior experience in those areas, be sure to include them on your resume. You'll find the highest level of employment for this job in the following states: California, Texas, New York, Florida, and Massachusetts; and in the following metropolitan areas: New York City, Los Angeles, Chicago, Boston, and Atlanta. As an office manager, you can expect to earn a median wage of $94,020 per year, or $45.20 per hour, according to the BLS. Learn more about business careers and administrative careers on Monster. Dedicated office management professional with experience handling a wide range of administrative, technical and executive-support tasks. Excel at resolving employer challenges with innovative solutions, systems and process improvements that increase efficiency, customer satisfaction and the bottom line. Skilled relationship builder with the proven ability to work with different personality styles. Advanced computer skills in MS Office Suite and other applications/systems. Helped drive a 10% increase in customer satisfaction based on a customer survey in 2007. Automated daily stats report that provided management with a key decision-making tool. Became a trusted assistant to company president, executive staff and office manager and earned a reputation for producing high-quality work. It's always a good idea to have someone look over your resume before you submit it to an office manager job ad. After all, you want to show hiring managers that you have a critical eye for detail—and a sharp resume is evidence of just that. Could your resume use a professional assessment before you send it out into the world? Get a free resume evaluation today from the experts at Monster's Resume Writing Service. You'll get detailed feedback in two business days, including a review of your resume's appearance and content, and a prediction of a recruiter's first impression. It's a simple way you can stay ahead of the competition.